That was always my favorite name for you. It was Grandma for a while, never grandmother, but usually Grammy. To me, that seemed the most familiar and loving. 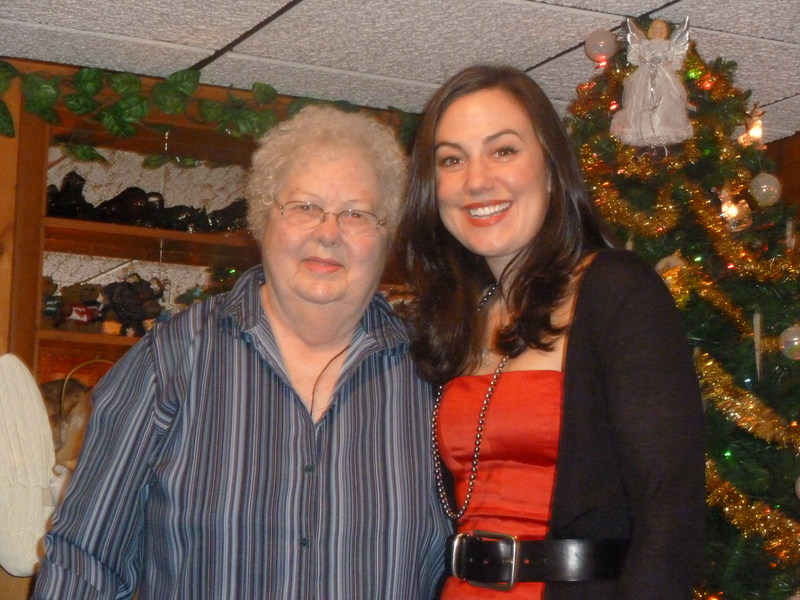 You were Mary Anne to your sister, mom or mother to my own mother and aunt, and The Matriarch to all of us. But it didn’t matter what name we called you, or what relation we were to you, you loved us all. All of these names could be synonymous with “strong woman”, because that’s what you were. You were the original Wonder Woman, who eloped at 16, had her first child by 17, raised two beautiful, intelligent and caring women, still managed to look beautiful and glamorous and did it all without smudging your signature red lipstick. And made us wonder how you did it all. I know it wasn’t easy. Starting that young was rocky at times, but yours and Pop’s love for each other was too strong to be moved in the following years and endured the test of time until his time had come to an end. Not to say it wasn’t tested. Like the time you wanted to come home from living in California and told Pop you were going and it was up to him if he wanted to come. So you boarded that plane with a baby and a toddler and made your way home. Mind you, this was in the 1950’s when things like that just didn’t happen. Your strength lasted through his passing when you were trying to find yourself in this new life you didn’t want, one without your partner. You channeled your healing and strength from your family and back into your family with the continuation of our regular Sunday dinners, watching us kids and finding joy in the new arrival of my cousin Michael. And as we grew, you nurtured us, all of us. You came to all our plays, performances and events and was the first one to brag about the good things we’d done. There was never a time I can’t remember you being there at the end of the performance with a card, usually with a rose or small teddy bear attached to it. Your strength continued to shine even as your health started to wan. You drove yourself to the hospital on Christmas Eve while having a heart attack because “you were fine, just felt a little tired was all”. Or the time when you slipped and fell on the ice outside your car and laid there for hours, until you managed to crawl, with a broken ankle mind you, to the door to get back inside where you could call for help. You came through that subsequent surgery and rehabilitation like a champ. And again, it wasn’t easy, but you had the will. And anyone that knew you knew that was enough. And strong for this last battle. You fought through the sedation to give us reassurances that you heard us and sometimes, maybe didn’t approve of what we were saying. Each eyebrow lift, hand squeeze and blink meant you heard us and wanted us to know you were ok.
Grammy, you’ve been a pillar of strength, and such an example of the kind of woman I want to be. Always giving – you did have two of everything – always generous, even when you really couldn’t afford to be. You put on the craziest display of holiday decorations I’ve ever seen and I’ll never enter a Sears at Christmas time and not think of you and how you transformed that house into a winter wonderland with barely a walkway path of exposed carpet. The rest was covered in decorative snow and animated dolls. You were always supportive of my dreams and I can’t wait to show you where I go from here. And I know you’ll know, because you said so yourself. I know you’ll check in on us from time to time to make sure we’re on the right path, or to let us know when we’re not. I miss you so much already and it’s been only hours since you’ve left us. I love you more than I can express, but I won’t say goodbye – I know you don’t say goodbyes. Instead, Gram, I’ll see you. My colleague Eric & I met u the other night at TEDx Utica…we’ve been thinking about how we could replicate your idea in school. I loved your letter to your grandmother…coincidently I am a new Grammy & my name is MaryAnne with an e! If u have any ideas I would live to correspond with u…keep up the wonderful work u do! Yes, hi Mary Anne! Send me an email at singlegirlcookies@gmail.com, and let’s keep the conversation going!